MALAYSIA, 15 MARCH 2018: HUAWEI, Malaysia’s second largest smartphone brand, today unveiled the HUAWEI nova 2 lite. Designed for young and dynamic users, this phone features the HUAWEI FullView Display as well as a stunning and sleek design. The dual rear camera and selfie toning flash enable users to enjoy photography experiences. Equipped with EMUI 8.0 based on Android 8.0, it offers smart, smooth experiences. HUAWEI nova 2 lite delivers spectacular functions and experiences that most fashionable photography enthusiasts can imagine. “The reception towards our nova 2 series by our customers over the years has been phenomenal and their support is very much esteemed. As a testament of their support, the nova 2 lite is made for the youthful and dynamic generation, encapsulating the customers’ needs. 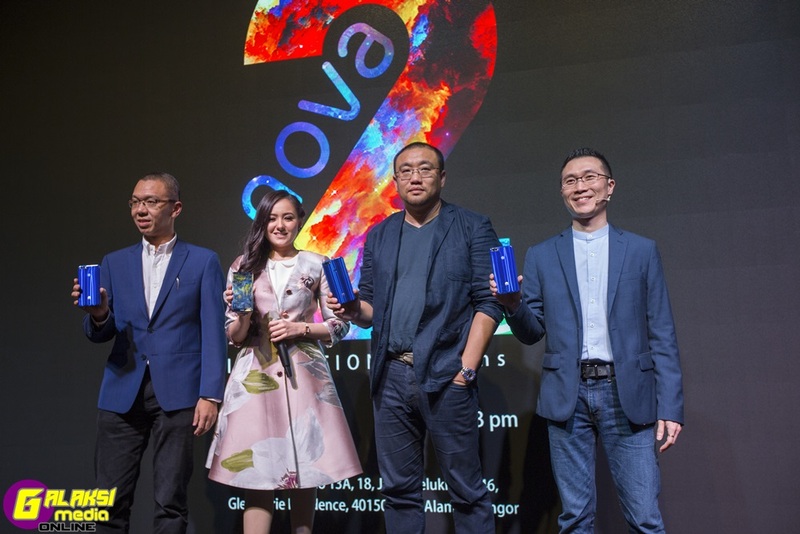 As such, we have also continued our collaboration with Hannah Delisha, who lives out the determination of the generation of nova superstars – a generation that will continue to propel their dreams and ambitions to soaring heights,” said Bill Liu, Country Director, HUAWEI Malaysia Device Business Department. HUAWEI nova 2 lite sports the 13MP+2MP dual rear camera with stunning wide aperture. The 13MP camera functions as the main camera while the 2MP camera provides bokeh effects with up to 7 aperture level for users to select from. The HUAWEI nova 2 lite also allows users to refocus after one photo is taken – users can select the focus level of the bokeh effect manually under the wide aperture mode to ensure everyone is in-focus under the spotlight. The HUAWEI nova 2 lite features an 8MP front camera with the advanced selfie toning flash, which automatically detects the lighting on the subject’s face and intelligently adjusts the level of brightness for a natural-looking selfie, producing flattering soft light in low-light or even pitch black conditions. On top of that, users can take perfect selfie anytime, anywhere with the 10-level beauty mode. Following the latest development in FullView Display design, HUAWEI nova 2 lite fits the impressive 5.99-inch HD+ HUAWEI FullView Display into the 5.5-inch compact body which traditionally houses a 16:9 screen. The bezel-less 18:9 aspect ratio shows 12.5% more than the usual models, delivering wider view for users. Coupled with the 2.5D curve glass panel, HUAWEI nova 2 lite also features a sleek body with comfortable grip, creating a smart and stylish premium look. With a thickness of 7.8mm, the unibody design has an astonishingly sleek and smooth finish. This phone is available only in Black and Blue in Malaysia. While the Blue variant features unique light beam patterns with a shiny glass-like effect, it still retains its durability, allowing the youths nowadays to express their personality easily. Capturing the youth’s literacy on technological trends, HUAWEI nova 2 lite has also introduced high-precision face unlock and fingerprint unlock features. Face unlock is powered by AI facial recognition algorithms that enable the device to detect 1,024 feature points of a human face and map the information accurately. It takes just milliseconds to unlock the phone in a flash. The HUAWEI nova 2 lite also features the fingerprint unlock with fingerprint sensor 4.0, which allows users to unlock the device in less than 0.35 seconds. Smooth experiences are essential for all smartphones. The HUAWEI nova 2 lite is built in with a 3GB RAM and features the customized EMUI 8.0 based on Android 8.0, to bring users the best advantages of software and hardware. EMUI 8.0 is integrated with machine learning algorithms that actively learns users’ behaviours and usage patterns to intelligently predict their needs, ensuring adequate operational space and better system performance. In addition, the HUAWEI nova 2 lite also introduces other useful functions such as the smart split-screen, eye comfort mode, three-finger screenshot, and floating navigation dock, providing a much more convenient and user-friendly experience. Housing a 3,000mAh battery, HUAWEI nova 2 lite users can continuously watch videos for 13 hours or play music for up to 58 hours. Combined with the power saving 6.0 that utilizes energy-saving technologies in both hardware and software, the HUAWEI nova 2 lite preserves battery consumption. The HUAWEI nova 2 lite features three-card slots, designed to simultaneously support primary and secondary Nano SIM cards as well as a Micro SD card up to 256G, allowing users to go through their day without any worries in terms of memory capacity and sim-card interchange abroad. Share WiFi connections further with your friends and family members through the ‘WiFi Bridge’ feature, available in the HUAWEI nova 2 lite. The new addition to the nova 2 series can act as a bridge to increase WiFi reach from the phone setting. HUAWEI nova 2 lite is available from 23 March 2018, with the attractive price of RM799.00. The phone can be purchased at all HUAWEI Experience Stores, authorized resellers as well as Celcom and Maxis authorized stores. Furthermore, to sweeten the deal, HUAWEI will be giving away complementary HUAWEI travel bags, while stocks last.